Lina Nilsson’s does research on implementation of eHealth. She is a senior lecturer at the Linneaus University and works in health informatics. She has a background in sociology with leadership and management. Lina did her PhD project in Applied Health Technology (up until 2014), on using IT to improve communication between patients and healthcare staff. In her thesis, she identified social challenges when implementing Information systems in a Swedish healthcare organization: power, alienation, professional identity and encounters are aspects that may influence the implementation process. Today, she is engaged in education but also research and development projects with focus on eHealth at Linnæus University. During her talk she discussed the professional identity of being a good nurse that is not the same thing as being good at IT systems. That working with IT was not seen as a part of the core professional nursing profession, and that previous bad experiences of implementations affect future ones. Suspicions based on previous experiences of implementations, attitudes along the lines of “it didn’t go that well last time, why should we trust this one to be any better?” are challenging for an implementation project in health care. eHealth can provide tools that are appreciated by health care professionals, but also affect their work in ways that they do not. For example by affecting traditional power structures between professions. Today Lina Nilsson has focused her research on nursing. One thing that she has found is that ICT implementations solve certain problems related to work, but that it also introduces new problems. She is also working in a project, ePATH, directed at supporting patients and empowering patients in care at home. In another project, she is involved in researching how small and medium sized enterprises can compete more fairly with larger actors on the market for providing HIT to health care organisations. To get paid sick leave in Sweden, one must obtain a medical certificate from a physician and get it approved by the Social Insurance Office (Försäkringskassan). A recent report showcase that 9,7 % of all medical certificate forms are sent back to the issuing physician by Försäkringskassan (2017), needing completion or re-phrasing of the filled in data. The biggest culprit in the form is the field where one should describe how the patient’s condition hinders them from working. In collaboration with EPJ, Region Uppsala and the company Inera, I will in my master thesis evaluate if a digital version of the form can help mitigate the frequent rejection of forms (due to phrasing). With a number of different prototypes, we will try to uncover if contextual instruction to each form field can help physicians fill in the form in a way that better corresponds with Försäkringskassans expectations. The project has a great potential not only to ease the burden of an already strained health care system (and their patients), but also in regards of understanding physicians’ needs when it comes to IT. In the best of worlds, the results can help us design better health care systems and ensure a sound health care. It is truly exciting to work on projects that has the potential to impact many patients’ life quality, where an early approved medical certificate can mean the world to many. Anton Björsell, Uppsala University. The study is my master thesis project within HCI and is planned to be executed throughout February to May this year. Except my focus on HCI, I also hold a bachelor’s degree in Media and Communication Studies. My favourite kind of research is the one which makes an honest attempt to understand humans and their needs. I am very excited about the project and grateful for having the opportunity to work with a topic that concerns so many people. Mid July, Diane Golay and Christiane Grünloh attended the summer school on “Doing and Communicating Qualitative Research” at Kingston University in London. This summer school has been offered already before and the main organisers are Evanthia Lyons and Adrian Coyle, authors of Analysing Qualitative Data in Psychology (Sage). The participants were quite active on Twitter during the week, using the hashtag #KUQRSS (Kingston University Qualitative Research Summer School). Celia Kitzinger gave an inspiring keynote on “Making a difference with qualitative research”. Her current focus is on “exploring the cultural, ethical, legal and social dimensions of coma, the vegetative state and the minimally conscious state”, which you can learn more about on their website. Reflecting on research and the “impact” we want it to have, one might wonder: How do you make a difference when you only have a small sample? Celia shared an example from her research, which was really powerful. They had interviewed relatives from patients in a vegative / minimally conscious state. Afterwards they gave them postcards, on which the interviewees could share something that they wanted the doctors and lawmakers to know. These postcards were then later made into an exhibition that doctors and lawmakers attended. Pictures from, for example, one doctor reading the postcards in that exhibition were then shown to the relatives. For these relatives, it made a big difference that the doctors had read their postcards. This showed us that with relatively low-key and simple tools, it is possible to make an impact – make people’s voices heard and establish a communication between groups of people that otherwise do not come into contact with each other (like for example in that case, lawmakers and patients’ relatives). Inspiring! Dariusz Galasiński gave a keynote on “Qualitative discourse analysis and psychology: Extending the possibilities”. As a linguist he shared interesting experiences, for instance, from an study on questionnaires. They used the “Think aloud” method while participants completed a questionnaire, because they were interested in how people interact / cope with questionnaires, their construction of their choice, and what did people say about the choice they were making. This was really interesting, as some of the questionnaires put a number to an emotion. He gave “despair” as an example and that you cannot have “little” despair, because being despaired is always “big”. A participant said, that he felt not despaired, but a little bit weak, so “let’s put a little 2”. The workshops proved to be extremely helpful and relevant for our research. They provided theoretical background which we could then apply in hands-on exercises. We got many practical advice during the week, which are also relevant for experienced researchers. For example, in the workshop on IPA (Interpreative Phenomenological Analysis), it was recommended to conduct the first 2-3 interviews, transcribe them and then have a supervision and discussion with someone. The supervision focuses then on questions like: Do they really talk about things that you want them to talk about? It was also said that sometimes you notice small things; for example that you ask a lot of closed questions. The lecturer was then asked, if this supervision is also needed if the researchers is very experienced. Yes indeed, as it is unlikely that they have worked with these population group or asked these interview questions before. The hands-on workshop on interviewing, already mentioned in a previous post, was definitely a highlight. It covered all the most significant aspects of designing an interview schedule and actually conducting an interview. At some point during this second phase, Diane was given the opportunity to put herself in the shoes of the interviewer for a while, and received valuable feedback on how to improve her interviewing skills. A very instructive experience! Every day, we had the opportunity to attend a consultation clinic – an hour of discussion in a small group with an experienced qualitative research, during which we could ask questions related to our own projects. This was an excellent opportunity for us to get expert advice on our current and even future research endeavours. Getting a fresh perspective on our projects, from people who did not belong to the same field as we did, was extremely interesting. It led to very constructive and creative discussions – so much so that the time always seemed too short, even after a whole day of active mental work! We found the consultation clinics so helpful that we made use of them even on days where we did not have a particular question ourselves, because it was very valuable for us to get the opportunity to learn from the projects of others and the recommendations they received. 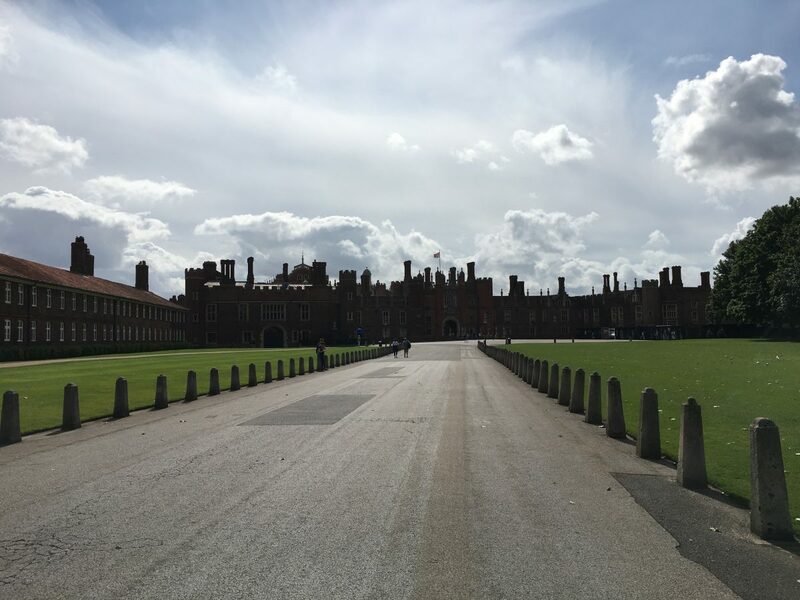 On the last day, we visited Hampton Court Palace, which you can see on the picture accompanying this post. We were a surprisingly small group visiting, but we very much enjoyed both the visit and the company! We wholeheartly thank the organisers – especially Prof. Adrian Coyle – for this fantastic week and highly recommend this summer school to everyone interested in qualitative research!